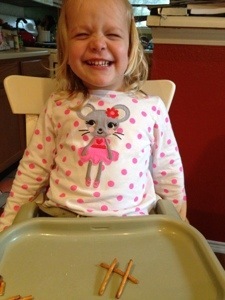 Hannah wanted to sit in the high chair seat for snack because she was pretending to be a baby. Then she proceeded to proudly create an “H” with her pretzel sticks on the tray. I tried to explain this was proof she is beyond the baby seat. This is one of those non-recipes. I just put a few things together and didn’t exactly measure. 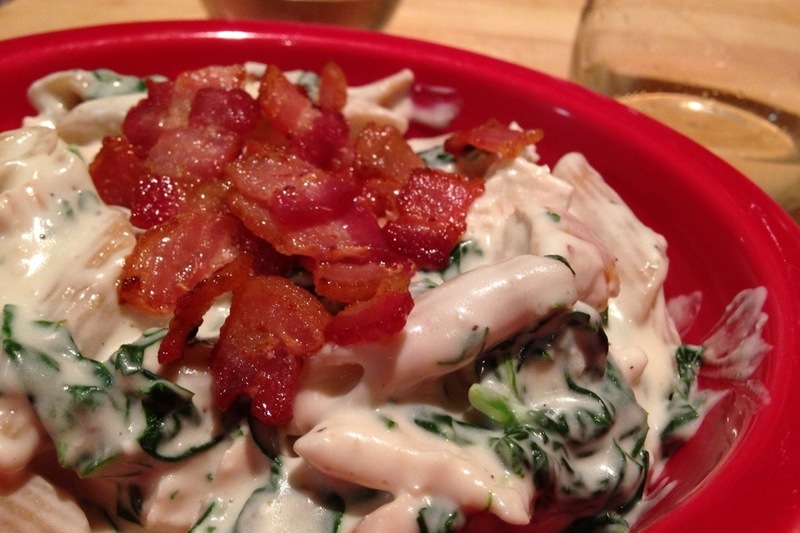 I cooked some spinach and bacon. Brett grilled some chicken. I cooked some pasta and made a white sauce and added cream cheese. Then I mixed it all together, and we ate it. Hannah really liked this; penne seems to be her favorite pasta shape. 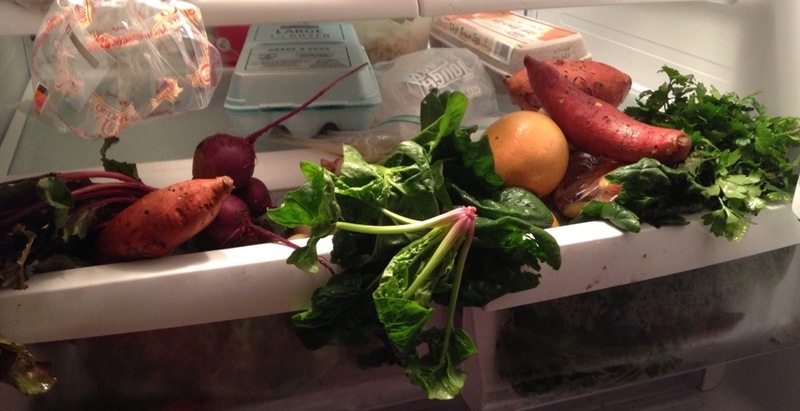 Another blogger I follow has started doing “snapshot” posts – just a photo of daily life with a sentence or two. She has a baby the same age as Violet (plus ten more kids), so I understand the desire to post but the limited time to put something together. So I figured I might do a few snapshot posts myself. We got our CSA box today, and Hannah was very proud that she carried it in from the car and put everything away all by herself. There was a rolly ladybug like our rolly bee. 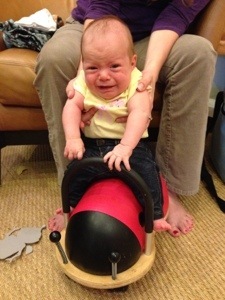 We decided to put Violet on it (4 wks old at the time). Not a fan. 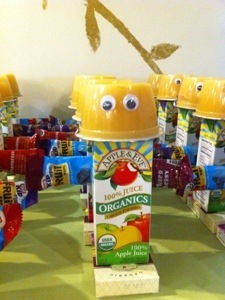 Robot snacks could not be more cute. Totally under-appreciated by Hannah, of course, she just wanted to eat it. This one needs a caption contest, ready GO! 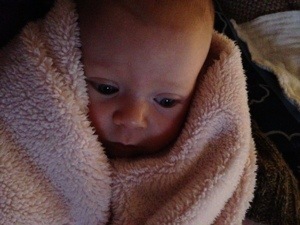 Last week, we were bundled up. 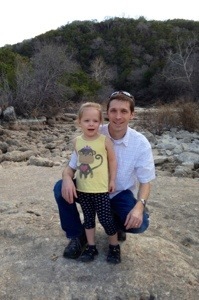 This week, we got to hike on the greenbelt. Also, I’ve been doing more posts via the iPad WordPress app. This is very convenient, but I’ve noticed the trade-off is photo appearance. So I’ll keep experimenting, but if you’ve noticed things looking a little different, that’s why. And apparently the email subscriber notifications have not been sent lately, so if you’re reading this – yay! You might just check the site directly for new posts. 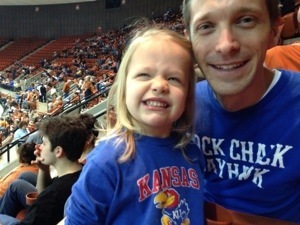 We were unexpectedly blessed with some last-minute tickets to the KU/Texas basketball game today. The easiest option seemed to be to find some friends to go with Brett. But some friends already had tickets and another friend was still doped up on pain meds from minor surgery. Even after posting on Facebook, we didn’t have any takers for the extra seats. So we decided to make it a family outing. Taking a 3-month-old who will only breastfeed and 3-year-old with a penchant for bolting to a 16,500 person arena requires some planning. We gave ourselves plenty of time and were able to park in a garage with a very short walk. Then we got a lunch of exciting concession food: hot dogs, nachos, Coke (which we even let Hannah drink) and cotton candy. 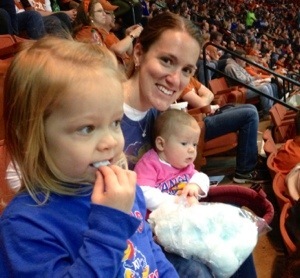 Unlike Allen Fieldhouse, the Erwin Center has comfy padded seats. But they are the kind that springs up which scared Hannah a little since she is not quite heavy enough to keep them down. So she spent the game either standing in front of her chair or sitting on Brett’s lap. Violet snuggled in the Ergo carrier for most of the time and woke up for some action partway through the first half. Both she and Hannah thought it was pretty loud, though Hannah enjoyed the permission to yell whenever she wanted. She was a little confused because she thought that she was going to get to play basketball, and she apparently didn’t find it very entertaining to watch other people play. She did make a game of “Where’s Bevo” and was always looking for the Texas mascot. Turns out there are a lot of KU fans in Austin! Hannah said, “There are a lot of Rock Chalkers!” We left at halftime per our plan since big girl was getting fidgety and baby was getting hungry. But the Jayhawks pulled off the win in a close game, and we had a lot of fun being part of it! We definitely don’t expect any white Christmases in Texas, but we have already had some chilly weather this winter. It got down to the 30s which is pretty cold for us (no snarky comments from the Kansas fam, please, I know…). The last week has been rainy every day, but we got a two-day break before more is on its way according to the weather map. 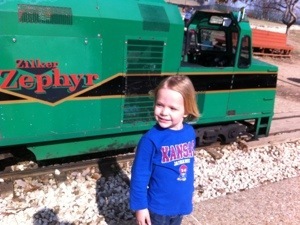 So we made the most of it by hitting the Zilker Park train. We got there a little early and ate a picnic lunch while sitting on the train. It’s a little tricky to do group shots when it’s just me and the girls, but we tried. 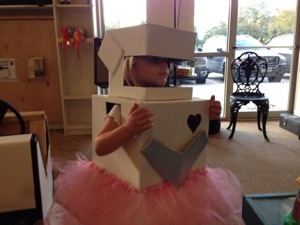 Then, all aboard, we were off! I think this is seriously the best $5 of entertainment in Austin. A 25 minute ride with lots to look at and a tunnel. 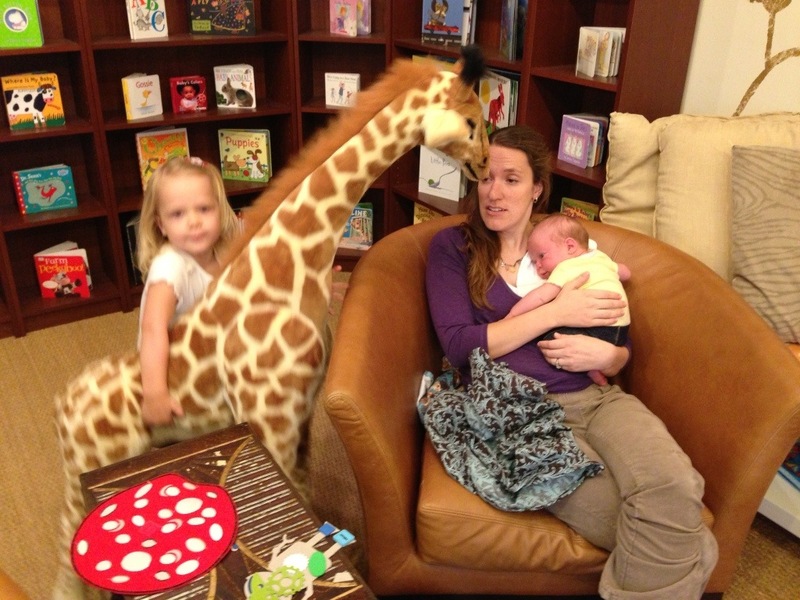 And Keep Austin Weird – I was one of three mommas nursing on the train, and there was a high count of guys with tattoos holding pink sippy cups. 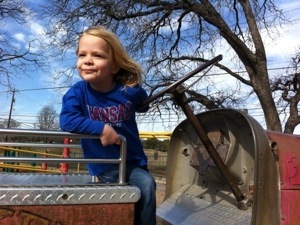 There is a fun playground right next to the train with a lot to do, including a fire truck. I’m not looking forward to the rain coming back tomorrow, but of course we need it. 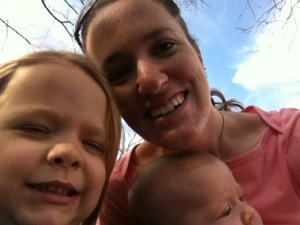 For now, I’m enjoying this gorgeous day with my gorgeous girls.